This weekend Luke and I traveled to my hometown because I had a very important date! Emily, Lindsey, Megan, and Whitney. We have had this planned for a couple of weeks now and I have been so excited! Well Saturday morning rolled around and I have to admit I got a little nervous. I thought: what if they don't like me? But I pushed through my nervous jitters and headed up to the restaurant to meet with them. We had such a GREAT time. Unfortunately Whitney was not able to make it, but Lindsey, Emily, Megan and I had a lot of fun just talking and talking. It definitely did not feel like the first time we had met. By the time we left we decided to do it again soon so that Whitney can join us! I am so glad I got to meet them, they were all so sweet! After lunch I went back to my parents house to spend the rest of the day with my favorite peeps! All afternoon we were kept entertained by my nephew. He is seriously the cutest little thing. He has recently followed the dogs lead and has taught himself to use the doggy door. I caught it all on film. "Hey guys, here I come!" "This is always the hardest part"
"Mission accomplished! Now I will hold the door open for Lily"
He is just so stinking cute and keeps us laughing the whole time! Sunday after church Luke and I got my favorite Outback and enjoyed a burger and fries. It was such a great weekend, I loved spending my time with my sweet family and loved meeting some new friends! SO good to meet you!! I had a great time :) That picture of him peeking through the dog door is adorable!! Have a good week!! It's so fun to meet new friends! I looks like you had a nice lunch. And those pics are adorable! That is hilarious! How fun!!! You girls make me want to come visit OK! SO much fun! What a wonderful group of bloggers to meet in real life! So exciting to all meet up!! Looks like yall had a blast!! FUN.. meeting up with bloggers... you are all gorgeous babes!!! 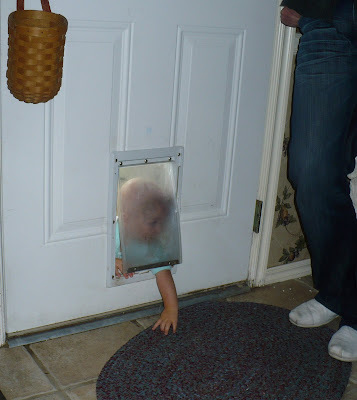 I need to take a picture of my HUSBAND going through the doggie door.. your pictures are much cuter! And you've inspired me... I bought Jillian's DVD yesterday... ready to SHRED myself now! How fun!! I'm so envious!! I would live to meet blog friends!! And are you just in OK???? Your nephew is precious, absolutely too cute!!! Glad you had a great weekend with family and new friends!! That lil nephew of yours is the cutest thing. Going through the doggie door ~~ who knew?!! Sounds fun! Meeting some of the girls from the blog-world. I think I would be super nervous too! Have a great week! you girls are all so cute :-) and so is that adorable little nephew of yours! Your bloggy meet-up looked like so much fun!! Yes, I do work with Alumni. I'm in the Office of External Relations for the College of Arts & SCiences, so I work with alumni from our college specifically and not the University as a whole. Seriously so jealous of your bloggy meet up! It looks like you guys had a fun time. And how cute is your nephew??? What a fun weekend! Your little nephew is a doll. I can't wait to be an aunt! ahhh that picture of you and the bloggy girls is so good!! so much fun!! 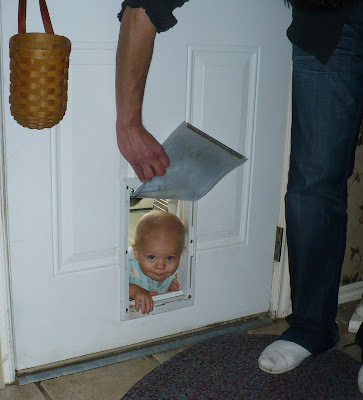 and that's so funny with your nephew and the doggy door, that pic of him finally through in his little pjs is adorable! glad you had a great weekend! How much fun to meet bloggers in real life!! I'm so glad you organized our meet up! It was so much fun! I love that M is using the doggy door. How funny! Sounds like so much fun! 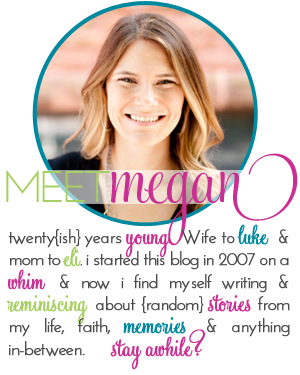 I would love to meet some of my bloggy friends in person! Haha, he is adorable! That is so neat that you met with fellow bloggers! how fun! That is so cool yall met up! Cute pictures! How fun! I'm so jealous! I bet you guys had a blast at lunch! That is so great that you all got to meet up! Meeting fellow bloggy friends is the BEST! I can't believe he can fit through the doggy door...that is hilarious! So glad you had a fun weekend! Maxton is as cute as ever! What a fun meet up! And yes, he is so STINKING cute! Too fun!!! Those are some cute girls at that table!! You girls are all too adorable! I'm sure you had a blast. I want to be in Oklahoma!!! Your nephew is too cute. I kind of want him! the meet up looks so fun!!! i'm so jealous!!! and your nephew-- how adorable is he?! Found you through Lindsey's blog- I like finding other Oklahoma bloggers! Your nephew is adorable, by the way! So much personality! Those pictures of your nephew are precious and funny! I had a bloggy meetup this weekend! They are very fun!